One compartment sink, no drainboard. Measures 24 x 24 and 14-inches deep with 8.75" backsplash. Galvanized legs and gussets with adjustable bullet feet. 18 gauge 300 series stainless steel. Fully welded gussets. NSF approved for food service use. Made in the U.S.A. The F1 series sinks from Aero are available in a variety of configurations. MF economy models are built with 16 gauge 304 stainless steel bowls, with 430 stainless steel used for the body. 3F models use higher quality 304 stainless for the bowl and body. 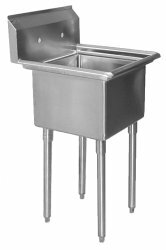 2F 'Aerospec' sink models use a thicker 14 gauge steel for the bowl and body, while adding enhancements including a 10 inch backsplash rather than the standard 7 inch, stainless steel feet, and cross bracing on the legs for additional rigidity. Various configuration options are available for widths and drainboards. All models have aero safety edges, 1/2 inch hot and cold pluming supply, and 8" o.c. faucet holes. Aero Manufacturing, headquartered in Clifton, New Jersey, is one of the leading manufacturers of stainless steel sinks, tables, dishtables, cabinets, shelving, and custom fabrication.